I’d been having no luck at all during December so I was looking forward to visiting Wales around new years because I figured a different country would bring different weather conditions. I was wrong however, and it pretty much just rained the whole time. I was only over for a few days so I was eagerly waiting for any opportunity in the weather forecast. I decided to take a chance one morning on a promised moment of sunshine at dawn. I headed for Cerreg Cennen Castle. It was wet when I arrived and it only got wetter. 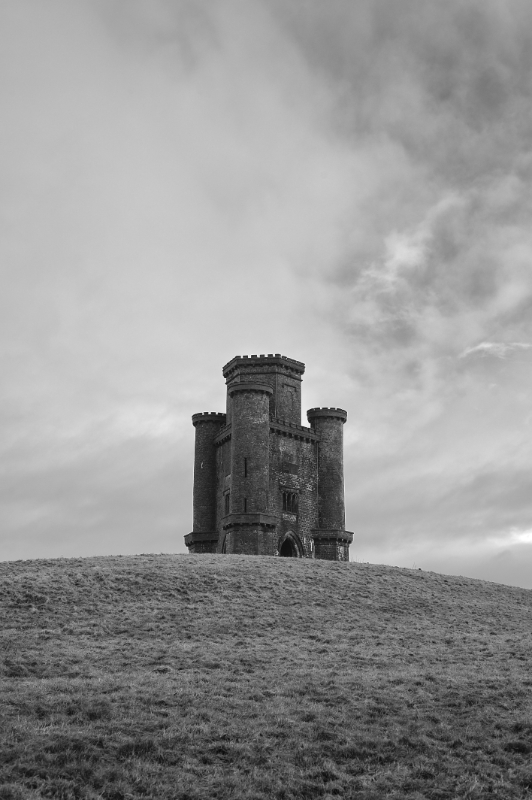 I had no choice but to give up, however I thought I may as well head to Paxton’s Tower which was kind of on the way home. By the time I arrived there it had stopped raining and you could even see blue sky in patches. I set up and waited for just a little sunlight to break through the clouds. I waited for an hour but it never happened. There was only the briefest moment when the cloud cover was a bit thinner and that’s when I got this shot. I left disappointed but in retrospect I like the way that there are no shadows cast on the tower.